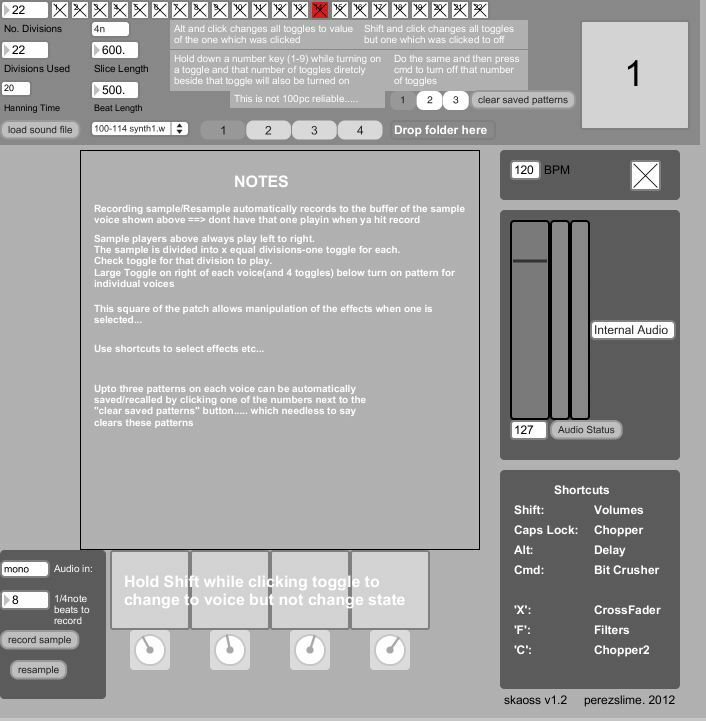 This program was created in Max/MSP and is loosely based on the “kaoss pad” by Korg. 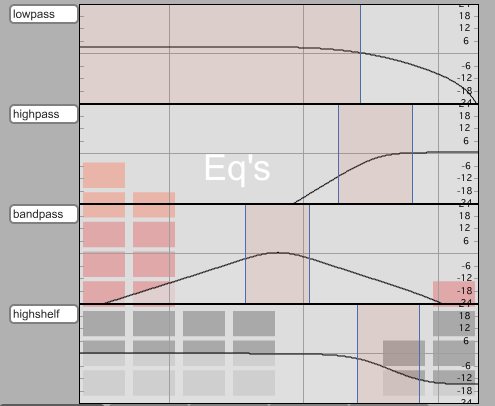 It consists of four separate sample players each of which has its own sequencer. 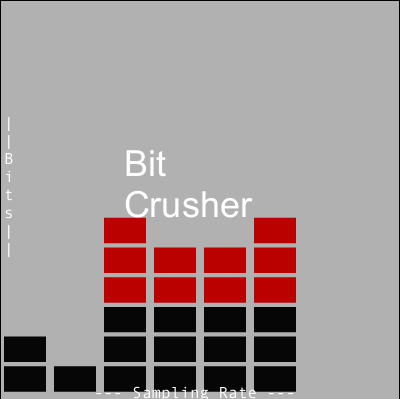 Each player is used to load a sample which is then divided into ‘x’ equal divisions. The sequencer is then used to determine which, if any, of these divisions is then played back-with the sequence always moving from left to right. The sequencers are then run through a number of user controlled effects which enables further manipulation of the audio. 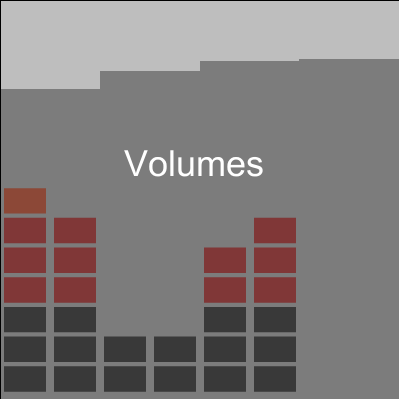 The effects available are: volume controls, cross fader, filters, bit crusher, delay, and two audio choppers, the first of which is user controlled while the second is algorithmic. All of the effects are controlled within the square control surface in the center of the program interface as seen below. The volume for each voice is controlled by four translucent sliders. 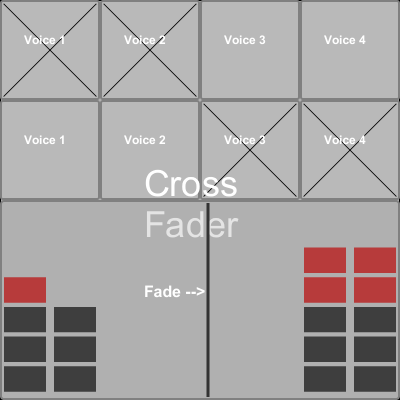 The crossfader requires the user to select which of the four voices to fade from and to and then a horizontal slider which controls the fade itself. 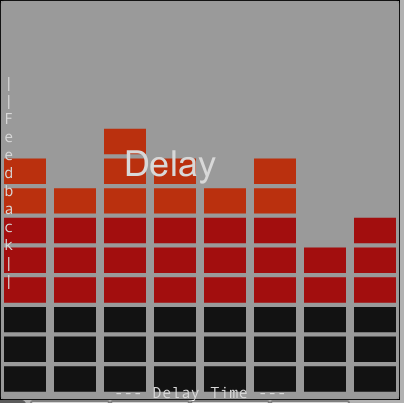 Both the delay and bit crusher effects give the user control of two parameters. For the delay effect the X-axis controls the delay time while the Y-axis controls feedback, and for the bit crusher the X-axis controls the sampling rate while the Y-axis controls the number of bits. 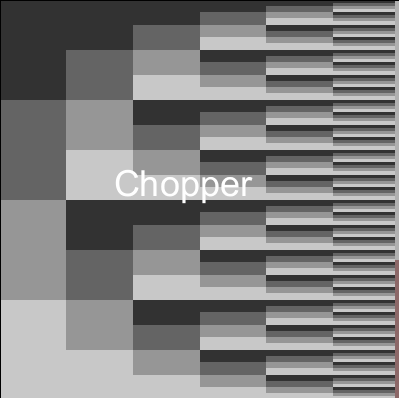 The first audio chopper effect records all of the audio from the sample voices into a circular buffer and the user then selects sections of this buffer to replay. The second one gives the user a number of parameters which are given individual probabilities and the program then uses this to determine the actions of the effect algorithmically. Finally the filters are simple biquad filters, one for each voice, which are controlled by a simple graphical interface. 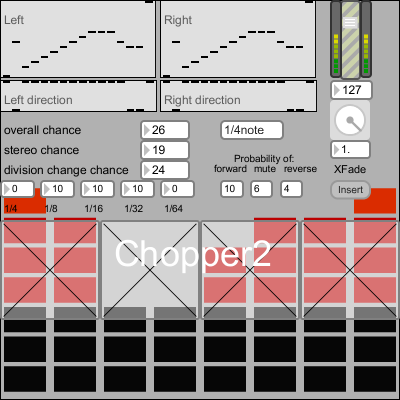 Other features include the ability to record audio into one of the sequencers in addition to resampling the audio which is being played by the other sequencers.